Some women are good at dodging men’s advances. When they start to sense romance after going out together several times, they turn down the men. Those women are called “Hagure Metal Joshi,” which means “Lone Metal Slime Girls.” The name is derived from a rare enemy character from popular video game series, Dragon Quest. 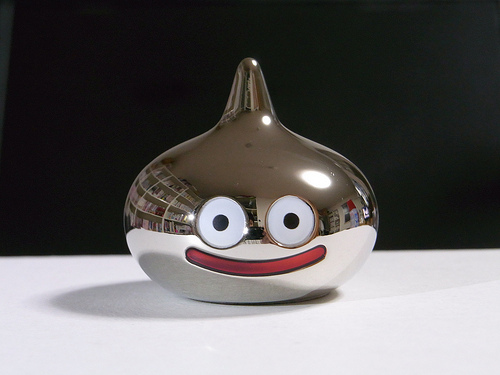 Because Lone Metal Slime is alert and has solid skin, the player can hardly give damage. Even the player gives some damages in a plodding way, it runs away in the end. Lone Metal Slime Girls are alert and have solid guard. Even men shows their affections to the women by asking out and giving presents, they run away before the relationships rise to another level. Not only do the men get rejected, but they become estranged from the women because the metal slimes are good at evading phone calls and text messages. There are, however, the two things that give “critical hit” to the Lone Metal Slime Girl; “money” and “looks.” These two items will break the solid guards.